DON’T MELT WITH THE MELTDOWN! In recent times, the discussions had been on the global economic recession or economic meltdown. Most formidable economies and companies had witnessed great shakings and losses. The stock markets had witnessed a down turn and many investment portfolios had not yielded much dividends. Many ‘great’ companies that exuded confidence to the world had been crying for bailout. Many had gone under and many jobs had been lost. Unemployment increased in many quarters. There is great fear in many quarters and in many hearts. Governments, corporate organizations, and individuals are cutting down on many things to remain afloat. The truth is that many did not anticipate this kind of dwindling experience; many got swept off their feet. In the midst of all these anxiety and trepidation, I hear a voice saying, “I have not given you the spirit of fear; but of power, of love, and of a sound mind”. I hear the voice also saying, “If you faint in the day of adversity, your strength is small”. So you do not need to be overwhelmed by fear and melt with the current economic meltdown. It may be very tough right now. But do remember that tough times don’t last, tough people do last. Someone said that every straining has got some training. It is time for us to learn from this straining not to put our trust completely in anything that is not God; because every other thing can fail or depreciate in value? I heard one man and he sounded like a pessimist. He said, “Darkness shall indeed cover the globe, and deep darkness shall cover the people”. He said experts and bookmakers would be proved wrong. He said predictions would fail and only people with divine illumination would remain afloat. He said many men and women would be cast down but only those with divine illumination would be lifted. I tried to verify the authenticity of his words and found out that all his words had always come true. So I concluded that the only way out of the current meltdown is not melting down but divine illumination. We have many great men and women around. But they were also caught up with the meltdown. I now believed the saying that great men are not always wise, neither do aged people have perfect understanding or judgment. Recently I heard that there is a spirit in man: and the illumination or inspiration of the Almighty God gives man understanding or insight that brings solutions. It is time for us to search for this illumination or inspiration that births the understanding that brings about solutions. I learnt recently that being alone is not the same as being lonely. Most profound ideas are received when we are alone; only alone with God as the only focus on our mind. Let us try reduce the traffic of activities going on our minds and give time for ‘thoughtful’ relationship or fellowship with the maker of all things; you only receive additional information about products or spare parts from the manufacturer. It is time to confer with the one who framed the globe with the words of His mouth; He has ideas and solutions to the current meltdown. Many people we call experts are just like reporters of news who may not necessarily be on the spot or scene of events, and may not have complete knowledge of the ingredients used to manufacture products. 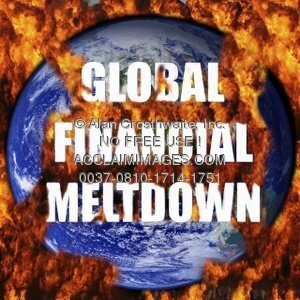 The globe that is experiencing the meltdown is a product and has a manufacturer. The manual, ideas or solutions can be got directly from the manufacturer. The manufacturer is available for consultation, and can be accessed by hearts that are also available. I advice that we make ourselves available and receive the immutable ideas that will enable us remain afloat and deal with the meltdown decisively. I saw a quote recently and it made a whole lot of meaning to me. It read thus: “Confidence in an ‘unfaithful’ man in time of trouble is like a broken tooth and a foot out of joint”. It is time to take our confidence and put back in God. Since economic experts were overwhelmed by the meltdown, let us try the One who cannot be overwhelmed by anything and who is forever faithful and true to His words; Let us turn to God. He is the antidote and has the antidote. With Him you cannot melt with the meltdown; when men are cast down His lifting is guaranteed. Stay blessed. When I was much younger, I did not understand what death meant. I had to ask my mum what death actually meant. She jokingly said, when someone sleeps and wakes up that means he is still alive. But when someone sleeps and does not wake up it means he or she is dead. From that explanation I did not understand that people can die through any other means other than through sleep. It was until much later that I knew people can die through other means and are buried afterwards. It was then that it dawned on me that when people die that you get to see them no more. And people react in different ways on hearing about the demise of a love one; some do not recover from the shock even after many years. I have been following an African myth that when people die and enough party is not thrown at their burial that the dead begins to disturb those alive in their family. It is a very strong belief in many quarters. When my father was lying in state during his burial ceremony, I asked him some unreplied questions. I held one of his legs, and asked him if he knew a party was going on, on his behalf. One elderly person nearby told me my dad was around and was hearing my questions. He went on to say that if I had spiritual eyes, I would see and would hear. But I turned to the old man and told him that I have realized that I cannot help my dad any longer. I also told my elder brother that there was no amount of noise, food, drinks, and even crowed that can contribute anything to his lifeless body. I also made him to understand that all the reverence they were giving his lifeless body amounted to nothing. I have heard different things about the Africans that I consider absurd. People from this part of the world prefer “Befitting Burial” to good health management and care. One diplomat who is not African said that a dead person is more important than the living in Africa . An African diplomat then added that in Africa we need to rush the dead to the grave lest the dead change their mind and put spanners in the “send-off” party already arranged. Money would not be released by members of the family, friends and associate for medical treatment but can be released easily at the demise of a person. What a culture! What an orientation! What a people! The government, corporate organizations, and the people of Africa are all part of this practice. During my dad’s burial ceremony, I saw many people who said they did not have time to come and see him during the brief period he was sick. I reasoned in my mind that they did not have time for the living but then some had to take casual leave to have time for the dead. What an attitude! At the demise of a person lavish burial ceremony and parties are arranged. Some individuals borrow to feed all their guests. How can a poor man lose dad or mum and you expect him to feed the whole community? The poor man had never invited his next door neighbour for dinner. If he does not do so, the spirit of the dead would not rest and would likely disturb him and his family. Out of fear of this crazy myth, many have been rendered paupers and beggars. Burial ceremonies come with pomp and pageantry. Expensive caskets must be bought and expensive slots must be secured in expensive cemeteries. And obituary announcements must be on prime time slots in the media. Money earmarked for certain burial ceremonies can put street lights and other basic amenities in a community. Notable musicians around the country must be around to entertain guests. It is amazing that the price of the casket alone most of the tine would have been more than enough to keep the person alive. People come with foreign and local currencies to spray musicians, guests and their host. Some times you are left to wonder if there are no longer poor folks in those families, communities that their lives can be changed with those funds earmarked to be spent or better “buried”. Uniforms are sewn for all for the burial for folks who may have been left for dead. Can the dead go home in grand style? Can the dead actually know what happens after they are gone? Are they affected by our cries, ceremonial waste and “befitting” send-off parties? I do not think so. I do think all these our ‘going home in grand style’ “buried dad or mum with lavish party’, ‘exotic burial’, ‘befitting send-off parties’ are all crazy things that most of us inherited from the older generations that must be eschewed. It is crazy to invest on dead people or in my own words ‘rotten meat’ than on the living. Everything about burial is buried stuff. It is no useful investment. Those funds should better be directed to better the lot of the living. It is a crazy orientation for folks to hoard funds and not help people and release those funds for their burial. Let’s learn to invest in the lives of the people and add value to life. Let’s appreciate the living; dead people don’t value appreciation or praise. P. O. BOX 17985 , IKEJA – LAGOS . Many of us do not need to be advertising practitioners or marketers to understand what a brand means. Street sense sees a brand as a product or service offered by a well known company and having that company’s name or mark on it. It is also true that when a product or service fails to meet the desired target set by the company or consumer’s appreciation, such product or service is repackaged or rebranded to meet the desired impact and approval by consumers. My aged mum would always say that a good product sells itself and may not need too much adverts. Some advertising practitioners do say that one of the most effective form of advertising is one-on-one. When a consumer can speak good of a product, many would through him or her get to buy the same product without having to see it in the media. Nigeria is a brand. And I do believe that if our nation is doing fine in all ramifications, there is no need for rebranding. Good works and products have voices and they do speak. Rebranding a Nigeria that does not work fine is just trying to wash the outside of the pot and leave the inside dirty. One of the foreign diplomats residing here said that he finds it difficult to believe official statements issued here. The people you are trying to sell the good image of the nation to all have representatives here who give them real feedbacks and get the rest from the internet. So it would amount to waste of time and resources for us to try to paint the picture of who we are not to the international community. It is obvious then that talking of rebranding Nigeria at this time is like changing the uniform of the police and not changing the policeman. It is very true that it is not the packet of sugar that sweetens the tea or coffee but the sugar. Trying then to change the packet of Nigeria may be a wasted exercise if Nigerians and their lives are not changed. They say that when character is lost that everything is lost. Talent is a gift but character is a choice. We have various talented folks in all the arms of government but they have character flaws. Public officers, lawmakers and enforcers of the law are the main law breakers. Things would not change until the orientation that laws here are supposed to be obeyed by the poor, ignorant, and the less priviledged is discarded. We just have an elitist polity. Nigeria is surely a hard brand to sell with this elitist attitude and character flaws. What kind of rebranding are we talking about? Can the leopard lose or change its spots? This kind of jamboree is not new in Nigeria. We have had different ones in the past. What actually were the impacts of such fruitless exercises in the past? Public funds were only wasted to put high profile adverts on the C. N. N and other media houses to sell a bad product. Former Minister of Information Mr. Frank Nweke Jnr did a similar thing some years ago going from one country and forum to the other trying to convince foreign investors to come and invest here while those in the corridors of power were going abroad to buy houses and invest there. It is time to let the authorities know that even God is more concerned with the depth of our roots than the height of our branches. It is said that charity begins at home. The present administration of the “servant leader” is just incapable of inspiring any confidence. Whatever they mean by the seven points agenda may just be alien terms in whatever they are preoccupied with at the moment. They must be able to convince Nigerian with genuine performance not on the pages of newspapers or television adverts. Which Nigeria do they want to rebrand? The nation where the Niger Deltans are still marginalised in terms of infrastructural development? Creating the Niger Delta ministry or having their son as the number two man is not the antidote to the crisis down there. A country that had lost notable citizens or politicians who were murdered without any clue yet as to why they died and who killed them is talking about rebranding. Does this rebranding entail change of attitude or orientation about power and how to get it? Will it deal with the do or die attitude to politics? Will rebranding stop electoral malpractices and thuggery? Will this rebranding stop everybody using siren at any time and for no reasonable reason? Will it stop Police pilot cars moving at break neck speed leading empty cars or jeeps to salon to pick the governor, legislator or public office holders’ wife? Will rebranding stop unstable policies of government? May be this rebranding will enhance the rule of law and its application. Let’s hope the rebranding will bring back the zeal to fight corruption and stop the presidency from hosting past corrupt office holders. Let this rebranding open up the National Orientation Agency to its responsibilities. The current N.B.A president said that Nigeria is like a football team led by a coach on a wheelchair. May be the rebranding would put the coach back on his feet again. There would be little or no need for image laundering or rebranding if the government is performing and inspiring confidence. This rebranding is an exercise in futility if it cannot address these problems and be able to change the attitude, character or orientation of the average Nigerian. Let’s wash the inside of the pot first; change is first within. You are currently browsing the arixty blog archives for March, 2009.